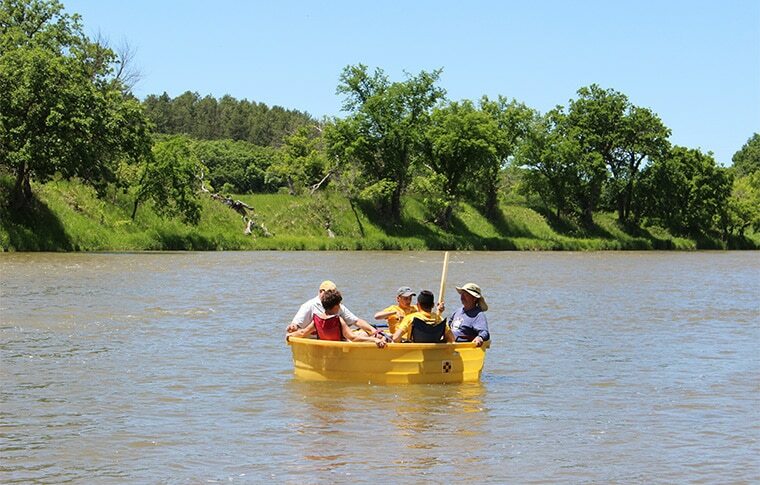 Our tank trips offer the perfect way to experience this fantastic stretch of the Niobrara River whilst relaxing with friends and family. You’ll move leisurely along the river for approximately four hours, with an opportunity to visit Nebraska’s highest waterfall, the Smith Falls. Stay Dry on the River! Located at 1005 East Highway 20, Valentine, NE, 69201. We will instruct you to Berry Bridge launch point. Difficulty Level This Trip is Suitable for Beginners with someone who is willing to get wet. Expect to be surrounded by beautiful Nebraskan nature whilst floating along the Niobrara River in one of our popular stock tanks. Unlike our other activities, not everyone in the tank will need to get wet, but be advised someone will have to jump overboard to stop the tank. So enjoy a snack and some drinks whilst enjoying the breathtaking scenery. We invite you to stop your tank half way to visit the magnificent Smith Falls waterfall, Nebraska’s tallest waterfall. Relax as the spring-fed, slow moving river gently carries you past the pine covered hills, steep cliff banks and waterfalls. The Niobrara River and its surroundings are home to a range of wildlife, including turkey, deer, rocky mountain elk, mink, otters and a whole host of birds. Keep your eyes out for herons, bald eagles and other species along your trip! Book Now to Guarantee Your Tank Trip! After launching our tank trips 15 years ago, they have become extremely popular. We are the only outfitter along the Niobrara River who offer the stock tank trips so there is limited availability. Please we aware that we only accept pre-booked reservations for this activity. Remember they do not have a steering wheel or a brake so at least 1 person will need to go overboard in knee deep water to stop at your landings. Each member of your group will be required to sign a waiver before embarking on the Stock Tank Trip. Parents are asked to sign these on behalf of their children under 18. Though the majority of your party can stay dry throughout the trip, at least one person will be required to get in the water to help tow the craft to shore at the finish site and at the waterfall. Very accommodating...always have a great time on the river with Little Outlaw... and crew!!! No place like Niobrara River and Rich will treat you very well.